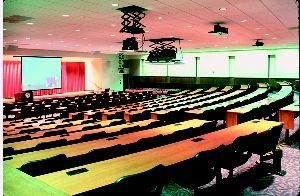 Located in Mandeville Hall, the Wolfington Teletorium™ is a combination classroom and auditorium offering state-of-the-art teaching and presentation capabilities to faculty, staff, and students. Equipment in the Teletorium™ includes computers and software, projectors, and cameras. Each of the 250 seats is equipped with a jack that allows users to plug laptop computers into the campus computing network. Additionally, the Teletorium™ can broadcast and receive video and sound nationally and internationally, making it a complete distance-learning facility. Ultimately, the Teletorium™ offers a glimpse of the future of education in which traditional pedagogical methods are combined with the latest technology to give students a full learning experience and assist in simulating real-work environments for teaching principles of business, art, and science.